This is a photo of some charter members of the First United Methodist Church. 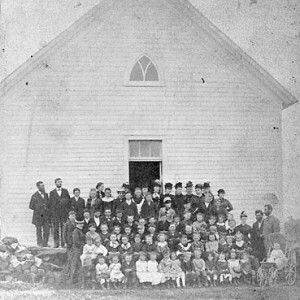 In 1871, Father James Gurley held the first formal Methodist service in Fargo in Pinkham Hall at the corner of Main Avenue and 5th Street. However, it was the Rev. John Webb who organized the first Methodist Sunday school and helped to build the first Methodist Episcopal Church. The land for the church was donated by the Northern Pacific Railway and was 30′ x 50′. It was completed on July 1, 1874, at a cost of $1,200 and was chartered 19 days later. The exterior of First Methodist Church. 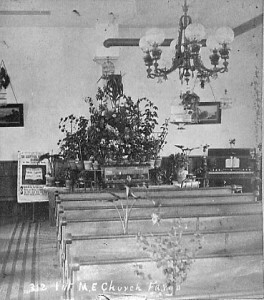 The interior of First Methodist Church. First United Methodist Church. “Our History”. web. Oct. 30, 2012.